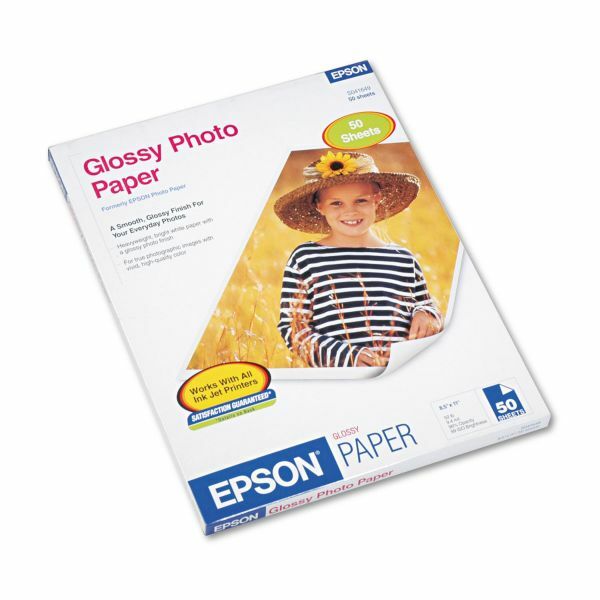 Print your own digital photos, reprints, contact sheets and enlargements. Brilliant photo-quality color and lifelike images. Epson Glossy Photo Paper, 9.4 mil, 8 1/2 x 11, Glossy White, 50/PK - Photo Paper Glossy delivers a smooth, glossy finish for everyday photos with the look of true photographic prints. Ideal for creating brilliant photo quality color and lifelike images. Print your own digital photos, reprints, contact sheets and enlargements on your inkjet printer. Glossy finish looks like a photograph. Quick-dry surface means no waiting for your prints to dry. Long-lasting prints preserve your treasured memories. Paper offers an 8.1 mil thickness and 52 lb. weight.